SEOUL, South Korea--(BUSINESS WIRE)--LetinAR, a startup based in South Korea, today announced CES attendees will able to see the future of Augmented Reality smart glasses at its CES Eureka Park Booth: Sands, 50516, on Jan. 8-11. LetinAR PinMR™ AR Optical Solution is set to replace traditional optical solutions for Augmented Reality (AR) smart-glasses. It boasts much more superior performance than competitors. No current solution has satisfied users and experts due to their under-par performance, while LetinAR PinMR™ Lens offer small form factor, wide Field of View (FoV), simple manufacturing process, and accurate color expression. LetinAR is set to demonstrate its mechanism and showcase the full line-up of its PinMR™ Lens modules. Other demonstration will include the PinMR™ lens with more than 80 degrees of diagonal FoV. After CES 2018, LetinAR has raised USD 5.4M Series-A fund from the biggest internet corporations in South Korea and multiple Korean VCs. This year, after raising the fund, LetinAR will demonstrate PinMR™ lens equipped with enhanced performance. Many global smart glasses manufacturers showed high interest in PinMR™ technology and have set the private meetings with LetinAR. LetinAR team is available to provide insight into the AR market and technology trends. Jaehyeok Kim, CEO of LetinAR will present news conference “Why can’t we have true Augmented Reality glasses, yet? : Bold suggestion to tackle the AR optics problem“ at January 8, 2019 11:00AM in Bellini 2003, Venetian. Private meetings, conference slots and press interviews can be booked by visiting https://letinar.com. LetinAR is a startup that develops optical solutions for Augmented Reality (AR) Glasses. 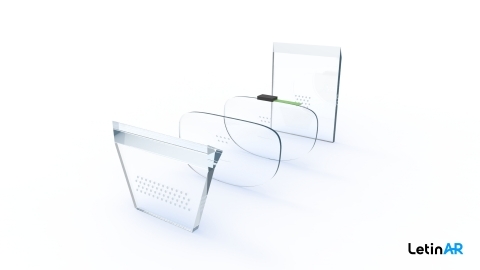 The optical system consists of LetinAR’s self-developed “Pin Mirror (“PinMR™”) lens” and a microdisplay made by external partners. Based in Seoul, South Korea, the company was founded in October 2016. It has raised $700,000 seed money from Naver, the biggest portal site and search engine operator in South Korea. LetinAR went on to receive $3.6 million in Series A funding from another internet giant, Kakao Ventures. LetinAR aims to break down the technical barriers that have long hindered the commercialization of AR glasses, with its trademarked PinMR™.